How would you rate your tooth brushing skills? Do you brush your teeth at least twice a day? Do you change out your toothbrush as recommended? Even though tooth brushing is part of our daily routine, turns out, many individuals have subpar techniques according to the American Dental Association. Over time, this can lead to ineffective results, or worse yet, irritated gums and damaged tooth enamel. When visiting a general dentist, he or she can identify areas of your mouth that you aren’t thoroughly cleaning and offer solutions to improve your oral hygiene regimen. At Metropolitan Dental Care, our team is passionate about helping patients maintain healthy smiles. We want to share with you seven common brushing mistakes, so you can do a better job between checkups. If you are looking for a general dentist in the Denver or Lone Tree area, please contact our office today online or by calling 303.534.2626. Although it may seem easier to brush your teeth with a side-to-side motion, long, horizontal strokes can eventually erode gum tissue. The American Dental Association recommends holding the toothbrush at a 45-degree angle and using short, circular strokes. Brushing harder does not equal cleaner teeth. If the bristles of your toothbrush have flattened or your gums bleed after brushing, you are probably brushing too hard. Aggressive tooth brushing can cause gums to swell and recede from the base of teeth, increasing your chances for an uneven gum line, tooth decay, and gum disease. If you have sensitive teeth and gums, you may want to look at the type of toothbrush you are using. Swap out your hard-bristled toothbrush for one with soft bristles. 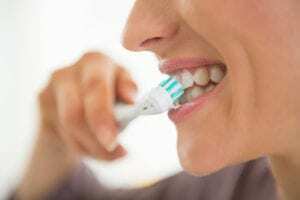 You may even want to consider investing in an electric toothbrush. These brushes employ circular motion, and you can select the toothbrush head that benefits you the most. You only need to brush your teeth for two minutes. Brushing too long or falling short of the two minutes can be detrimental. To help you reach this goal, try humming (or playing) the first verse, chorus, and second verse of your favorite song. When was the last time you bought a new toothbrush? If you can’t remember, that’s probably a good sign to go ahead and chunk it and buy you a new one. According to the American Dental Association, you should get a new toothbrush or toothbrush head every two to three months, because bacteria can accumulate on the bristles. If you become sick within the two-month period, you may want to swap out your toothbrush early for good measure. If you own an electric toothbrush, be sure to change out heads and clean the handle. After each brushing session, thoroughly rinse your toothbrush to remove any remaining food debris. The foods you eat and drink not only affect your teeth, but also your tongue. Your tongue is a hotbed of bacteria and that bacteria is the number-one cause of bad breath. Forgetting to brush your tongue can lead to chronic halitosis (bad breath) and increase your risk for tooth decay. Those who struggle with bad breath often find a tongue scraper beneficial. Both the outer and inner surface of your teeth should be cleaned equally. The most neglected areas are molars and the tongue-side or lingual surface of teeth. When brushing, make sure you give equal attention to those hard-to-reach areas to prevent dental stains and plaque build up. Think your oral hygiene routine needs some adjustments? Schedule a cleaning with a general dentist today at our Denver or Lone Tree dental practice to make the necessary corrections. You can reach us online or by calling 303.534.2626.